950 S/N $125, 95 A/P $175 Image Size: 18" x 24"
Lured by call and decoy, three trophy gobblers emerge over the crest of a wooded knoll. One of the bosses catches a movement and begins to decrease his fan. 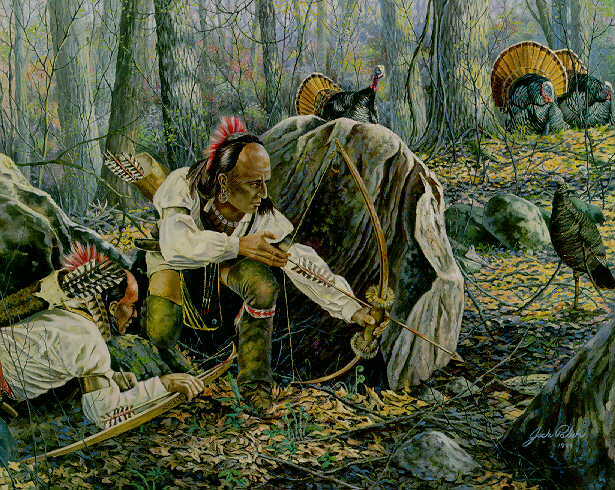 Who will be victorious, Turkey or Native Hunter in Jack Paluh's HAND IS FASTER THAN THE EYE. The American Wild Turkey has thrived in our Native Woodlands for centuries. Ever alert, they are swift on foot and in flight. These birds have offered a challenge to the American Hunter for generations. *A Conservation Edition has also been published for N.W.T.F.